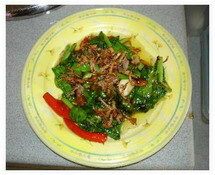 Kailan ikan masin is a favorite vegetable dish using salted fish. Normally eaten with hot steaming rice, it is a must have menu for Thai restaurants in Malaysia. It is basically a stir fry vegetable dish, with oyster sauce, cili padi and salted fish. The salted fish used in this recipe is king mackerel fish steak preserved in salt and then stored in soy oil. Kailan is also known as kale, a kind of green leaved vegetable with thick leaves and stems. This vegetable is rich in folate, the leaves are bright green and fibrous, therefore, very good for expectant mothers and those who are breastfeeding. 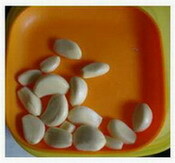 Stir fried kailan prepared with salted fish will help whet the appetites of queasy moms-to-be. 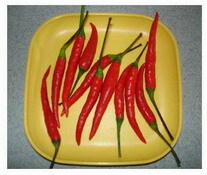 Kailan is not easy to clean as there is a water proof film when you try to wash it. I find that soaking the leaves with Vegesafe (a solution for cleaning fruits and vegetables) sold by Tupperware Brands helps solve this problem. 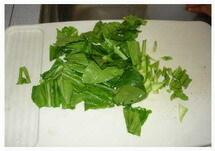 Since kailan has thicker stems, the stems should be sliced thinly diagonally also so that they will cook faster. The leaves are a bit bitter and not suitable for soup but for stir fries like in kailan ikan masin, they are excellent. Pour in corn starch mixture. Stir briskly. Fried shallot makes the dish very nice - a lot of difference in taste if you omit it. Malay cooks normally use "a thumb of this", "a handful of that", and similar analogy when describing the quantities required because they seldom use the measuring spoon or weighing scale. 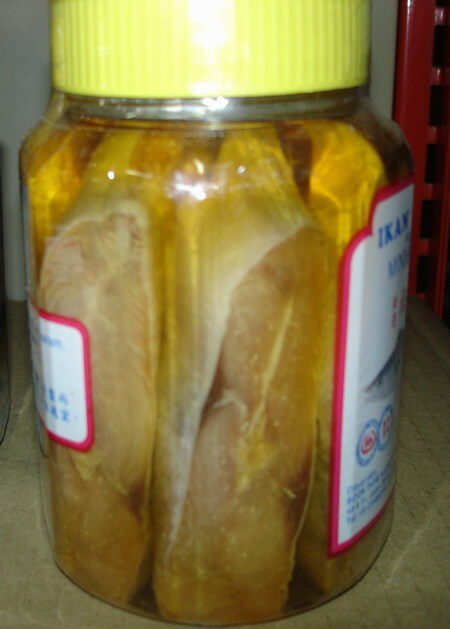 Pickled Fish (ikan tenggiri jeruk) can be replaced with salted ikan kurau with similar results. Even though all these preserves are mostly a specialty of certain regions, nowadays they are easily found in the groceries stores. It used to be people in a certain state rarely ventured out of their hometown. Now that a lot of young people migrate to other cities to pursue their education or to work, they bring along their favorite home-cooked dishes. As a result, we have a criss cross of taste all over the country.